For the 2017 model year, Ford gave the Escape some major updates to keep it fresh midway into its third production cycle. The Ford Escape is split into the base-level S, mid-tier SE, and top-of-the-line Titanium trims. Moving away from the boxed and rugged design of previous iterations, the new Ford Escape embraces a more streamlined design language. The angled lines, thinned grille, and sleeker roofline make the Escape look less of a traditional SUV than an aerodynamic crossover. The halogen headlights come with daytime running ability to increase conspicuity in the daytime. Fog lights for increased visibility, especially at nighttime, are added on the SE and Titanium. Power side mirrors flank the vehicle; the ones on the Titanium are upgraded with heating ability and turn-signal indicators. Added silver-painted roof racks on the Titanium provide additional cargo carrying capability. At the back, long-lasting LED taillights are joined by a dual chrome exhaust on the SE and Titanium for increased engine efficiency. And a power liftgate, which is exclusive to the Titanium, enables you to open the trunk without using the key. The S trim rides on 17-inch steel wheels, the SE gets 17-inch alloy ones, and the Titanium rolls with 18-inch alloy wheels. Although the base-level engine still remains the 2.5-liter Duratec inline 4-cylinder (I4) engine, Ford increases the horsepower to 168, in addition to its 170 lb-ft of torque. The SE and Titanium get the brand-new 1.5-liter EcoBoost turbocharged I4, which provides 179 horsepower and 177 lb-ft of torque. Designed for increased fuel efficiency (thus the naming), the EcoBoost comes with auto start/stop technology, which enables the engine to shut down and restart to reduce the amount of time it spends idling; this reduces emissions and fuel consumption. Linked to each engine is a 6-speed automatic transmission, which is meant to give you absolute convenience in driving. However, since it comes with a SelectShift® controller, you can always switch from automatic gear shifting to simulate a manual gearbox feel if you so choose. Although front-wheel drive is standard on the Ford Escape, you can opt for the Intelligent Four-Wheel Drive system to better ensure that the tires meet the pavement. Depending on configuration, you can achieve up to 23 mpg in the city and 30 mpg on the highway, as well as tow up to 3,500 lbs. As a compact crossover, the Ford Escape provides seating for up to five people. Passenger volume is measured at 98.7 cubic feet, and cargo space can be expanded to 68 cubic feet if you fold down the rear seats. Upgrading to the SE trim adds 10-way power adjustability on the driver’s seat. On the Titanium, Ford adds leather seat trim, 10-way power adjustability on the front seats, and a memory seating position system for the driver’s seat in particular. Regarding infotainment features, the Ford Escape starts at the base level with a six-speaker stereo system that includes AM/FM radio, a CD player with MP3 playback capability, and controls mounted on the steering wheel. Integrated with the stereo system is Ford’s in-vehicle communication system, which is named SYNC®. With SYNC®, you can make voice commands to perform functions like phone conversations and music playing. Upgrading to the SE adds a SiriusXM satellite radio subscription. On the Titanium, Ford overhauls the six-speaker system with a 10-speaker Sony audio system and an enhanced version of the SYNC® system named SYNC® 3. Also, the Titanium gets SYNC® Connect, a brand-new feature that allows you to remotely access certain Escape features with your smartphone. In addition to SelectShift® for simulating a manual gearbox feel, the SE trim of the Ford Escape gets paddle shifters mounted on the steering wheel. So, you don’t need to reach for the shifter to enjoy clutch-less semi-automatic shifting on the Escape. Also on the SE is dual-zone automatic climate control to extend HVAC control to the front passenger. The Titanium trim gets more additions. There’s a push button to ignite the engine without the need of key insertion, plus a start system to do so remotely; auto-dimming on the rearview mirror to reduce the glare of headlights from behind you, and a universal transceiver for remotely opening and closing garage doors. In the event of an auto collision, you are supremely protected in the Ford Escape. There are a pair of front impact airbags that face the driver and front passenger, a knee airbag for the driver, a pair of front seat-mounted airbags for side impact, and two front and two rear side curtain airbags mounted on the roof. Also on the Escape are a rearview camera that flashes a video image for monitoring when driving in reverse, an SOS post-crash alert system, an electronic Curve Control system for slowing down the vehicle when coming to a curve on wet or dry payment, and AdvanceTrac® with RSC® (Roll Stability Control™) for ensuring electronic vehicle stability. For security, there’s the SecuriLock® anti-theft system, as well as the MyKey feature for allowing controlled use of the vehicle with a configurable key. Choosing the SE or Titanium adds a SecuriCode™ keyless-entry keypad. The Titanium in particular has a perimeter alarm for a more robust security mechanism. The Honda CR-V is generally all-round compact crossover SUV, since it supplies outstanding interior space and fuel efficiency, plus Honda’s reputation for a high level of reliability. Another formidable rival of the Escape is the Hyundai Tucson, which strong points include a high level of safety, balanced handling, and a generous warranty program. The Ford Escape offers a lot more than it’s worth. Few, if any, compact crossovers come with a turbocharged engine choice, and its SYNC® system is highly acclaimed among reviewers for its user-friendliness and responsiveness. On the other hand, the Escape is hindered from soaring higher with its comparatively small interior space and a feeble base engine. The Ford Escape has a starting MSRP of $23,600 with the S trim, $25,100 with the SE trim, and $29,100 with the Titanium. 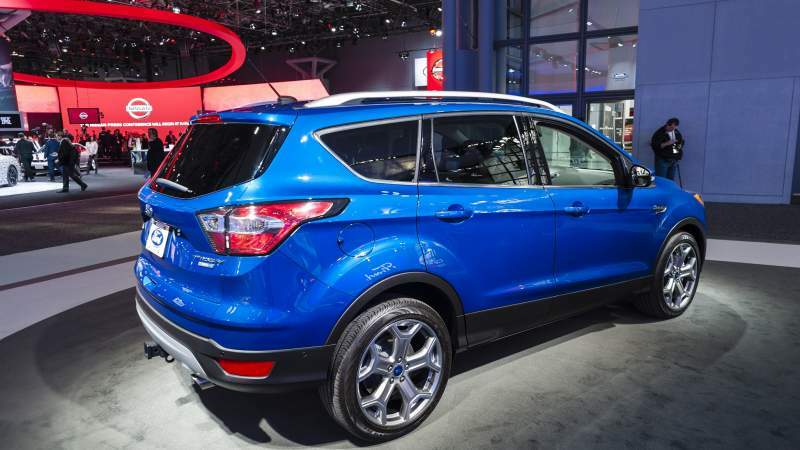 In terms of size, the Escape is the smallest vehicle in Ford’s crossover and SUV collection. It is placed below the midsize Edge crossover, the full-size Flex and Explorer crossovers, and the full-size Expedition SUV.